Public Policy: Politics, Analysis, and Alternatives, 4th Edition 4 Edition All too often, public policy textbooks offer a basic grounding in the policy process without the benefit of integrating the use of policy analysis. Kraft and Furlong, since their first edition, take a different tack. They want students to understand how and why policy analysis is used to assess policy alternatives--not only to question the assumptions of policy analysts, but to recognize how analysis is used in support of political arguments. 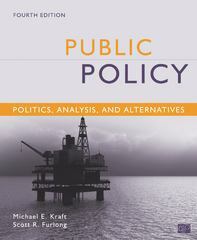 To encourage critical and creative thinking on issues ranging from the financial bailout to rising gas prices to natural disasters, the authors introduce and fully integrate an evaluative approach to policy.Public Policy starts with a concise review of institutions, policy actors, and major theoretical models. The authors then discuss the nature of policy analysis and its practice, and show students how to employ evaluative criteria in six substantive policy areas. Public Policy arms students with analytic tools they need to understand the motivations of policy actors--both within and outside of government--influence a complex, yet comprehensible, policy agenda.Enhancements to the 4th edition:- All chapters have been comprehensively updated to include recent events, issues, and policy debates including the conduct of the wars in Afghanistan and Iraq, the use of private contractors for military support and operations, the rising cost of gasoline and disputes over energy policy and climate change, the controversy over immigration policy, requirements for financial regulation, heightened concerns over economic and social inequality, and the clash over reforming taxes and entitlement programs, as well as dealing with the federal deficit and national debt.- New and updated "working with sources" and "steps to analysis" features help students investigate sources of information and apply evaluative criteria.- New and updated end-of chapter discussion questions, suggested readings, and web sites.